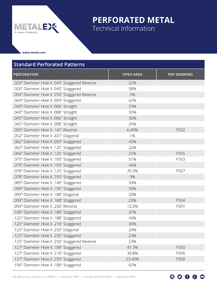 Looking for standard data on perforated metal patterns? Metalex has listed dimensions for each standard perforated pattern and their open areas. Complete the form to the right to download the technical data sheet for Perforated Metal products line. To download the technical data sheet, fill out the form on this page.